I had one of those orange C-90 Astros, but it was never a very good performer. I think I paid $100 for the entire kit. The mirror had some coatings problems, so I had it recoated, but that didn't help much. I also installed some long, nylon bolts so I could properly collimate the scope, but still, very little improvement. The mirror also had 7406 engraved on the back. I finally traded it away to someone who wanted the mount & tripod. I did keep the 7mm ortho and 18mm Kellner eyepieces, though. 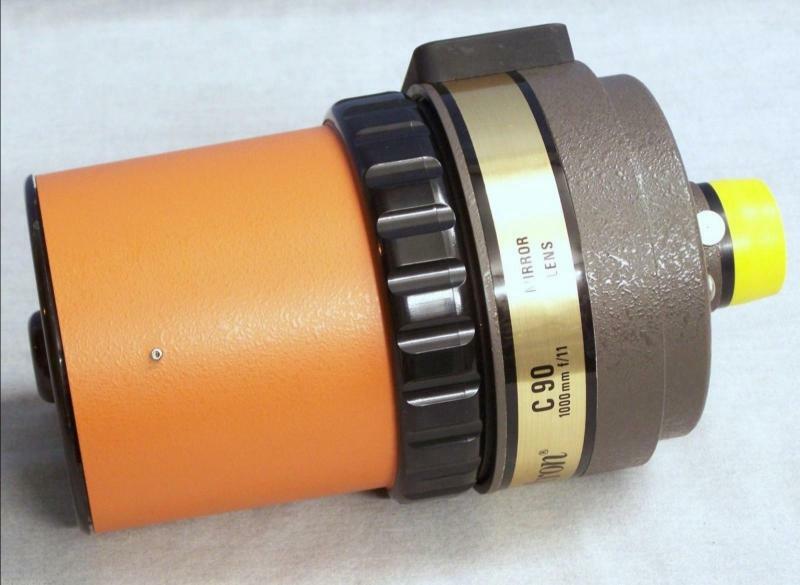 I now have one of the C-90 spotting scopes (which is quite good) and am regretting trading the mount away. 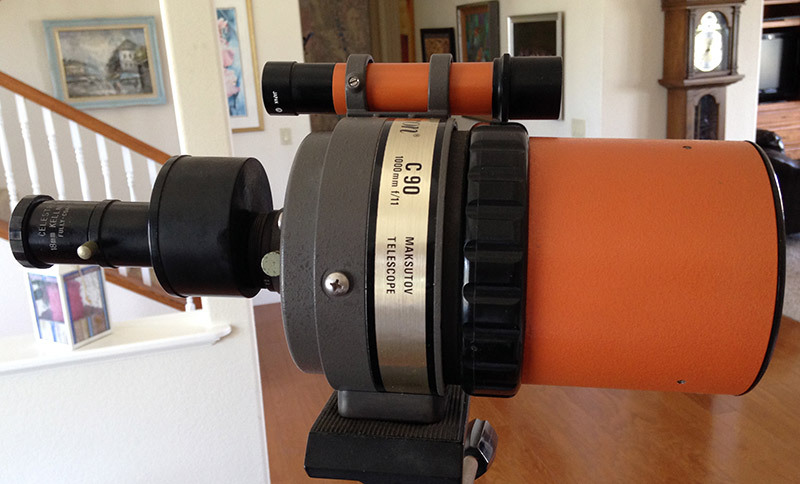 My C90 is one of my most used telescopes. my plants, look eye to eye with a dragonfly. 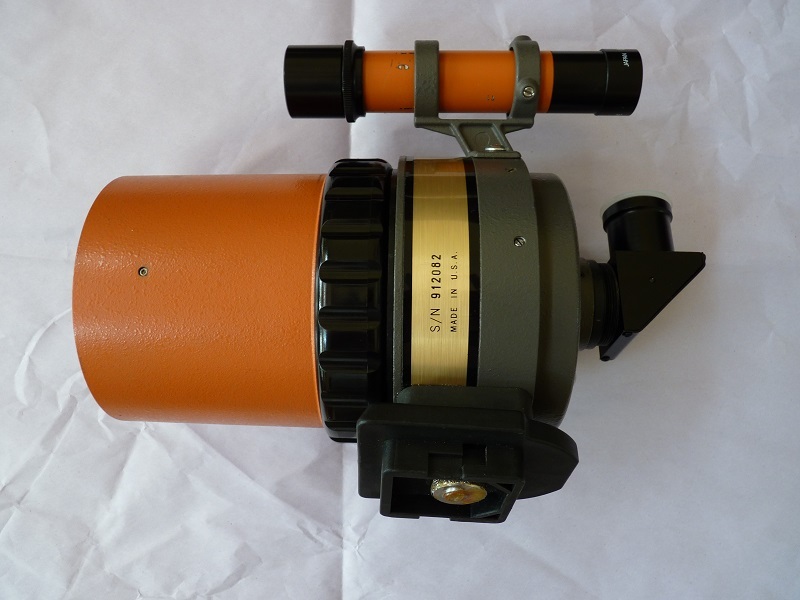 The helical barrel focuser is very fast which makes it ideal for nature. 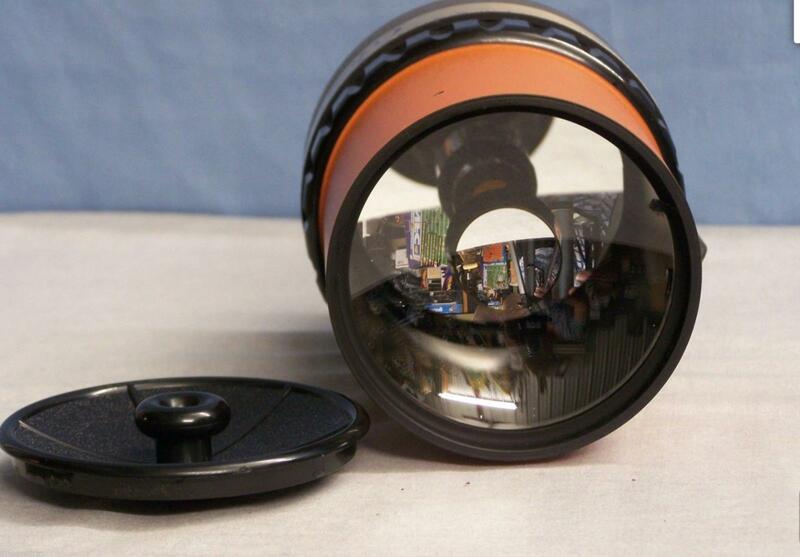 Wide Angle #93101-A eyepiece with the C90. materials. The C90 the only Mak, it must have been the milkman! Edited by actionhac, 30 April 2016 - 11:20 AM. "The C90 the only Mak, it must have been the milkman!" Wow! Amazing that, only two years ago, I ever would have called the meniscus lens a "Schmidt corrector!" I've learned a lot since on this forum. I've known for ages that the C90 Mak in fact had a meniscus lens. 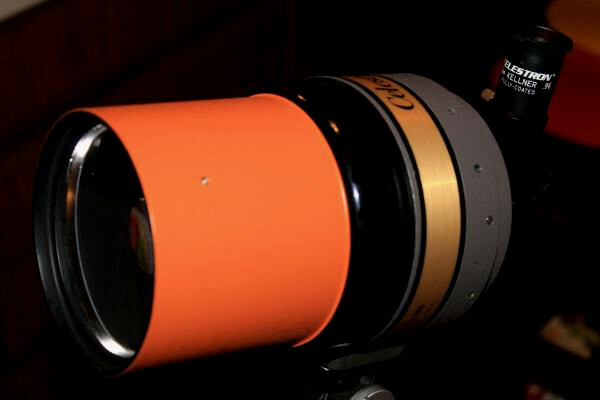 Thank you for clarifying the confusion between the "mirror lens" Celestron Maks and the "mirror lens" short-focus Cassagrain Meades. No wonder I was confused! I am going to return to my supposedly badly figured Taiwanese C90. I have wondered whether using 0.965" accessories, with the diagonal stuffed into the baffle tube, places the mirrors at the wrong distance to focus properly. If I got the 1.25" visual back (or a home-made, tape-and-cardboard imitation, for experimental purposes), perhaps the different positioning between primary and secondary would make my C90 sing! It had had trouble with a kind of spherical aberration that caused it to focus sharply during the day, if with washed-out colors, and yet left it unable to focus well on stars at night. It simply could not see many of the stars where it was pointing. Edited by Joe Cepleur, 01 May 2016 - 10:30 PM. I've owned two of these little scopes and both were/are great performers. The first one I owned was a second-hand black tube telephoto lens version from the early to mid-eighties that Terra described above. 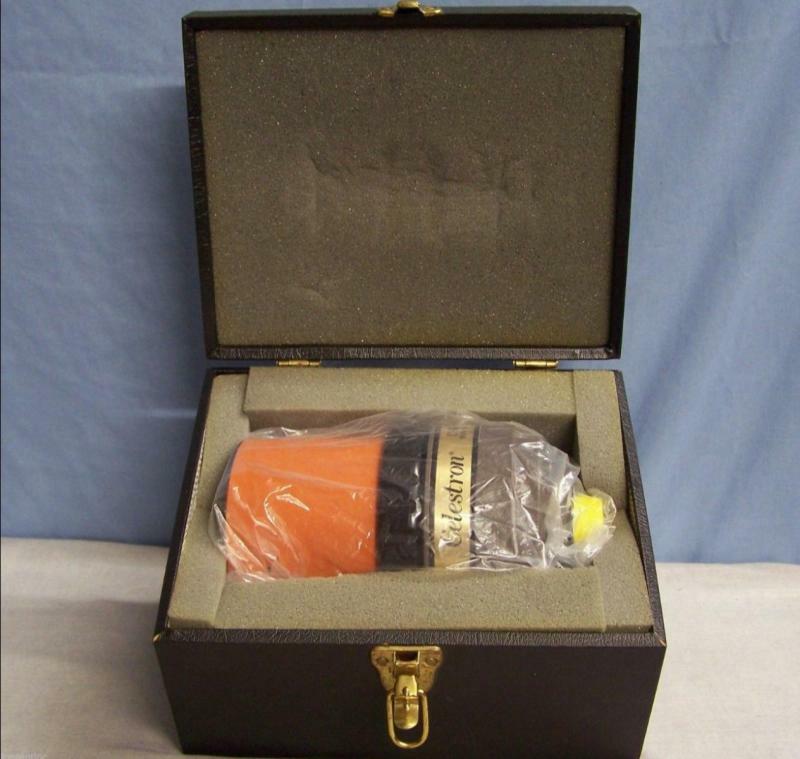 I remember at the time that the orange astro and the orange spotting scope versions were still available, but I got a great deal on the telephoto. I remember that I loaned it to a buddy that fell in love with it and didn't want to give it back. I think I ended up trading it to him for motorcycle parts or something similar. Anyway, it was a great little scope that, when given adequate time to acclimate, kept up very well with the Celestron C80 that I owned at the time. The second one I still own. 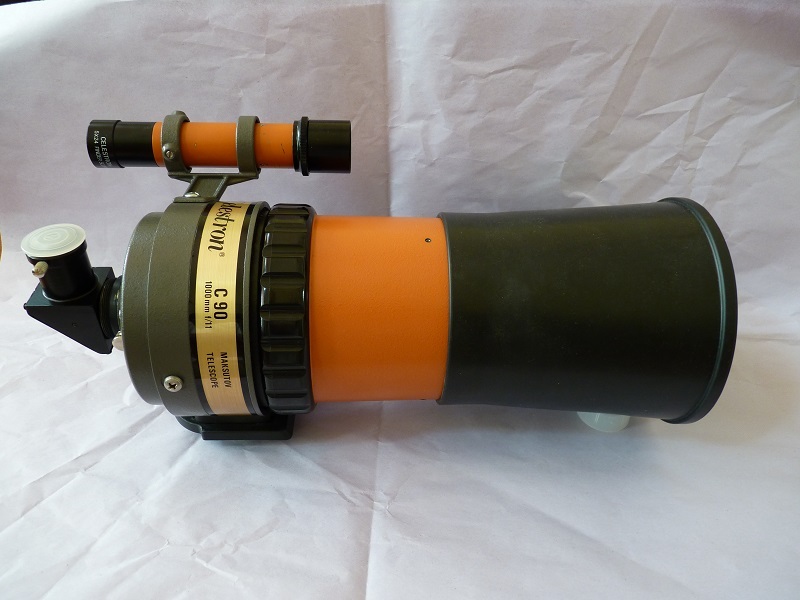 It is an earlier orange tube spotting scope version with optics very similar to my first one. In recent comparisons with a newly purchased mid-nineties Celestron/Vixen C80 with fantastic optics, this little C90 also held its own right up to 143x using my 7mm Unitron Symach eyepiece. The grs was easily visible in both, along with all the detail one would expect in the belts with scopes of this size. Sharp and distinct shadows from Saturn and its rings were very visible on that planet, along with a thin, but very steady Cassini division with both scopes. The C90 also performs on double stars just as you would expect from a good Maksutov - beautiful stars with a slightly thicker first diffraction ring when compared to a good achromat. A comparison of the C80 and the C90 on Epsilon Lyrae resulted in an easy split of both components and very pleasing views with both scopes. The only problem I've ever really found with the C90 is in that it requires time to acclimate in order to perform at its true potential. In all other respects, it's a great little scope. One thing I might add is that when I cleaned and re-greased the focusing mechanism on mine, I first used white lithium grease. I didn't like the feel as it felt too slick and you could easily feel any imperfections in the focusing mechanism. 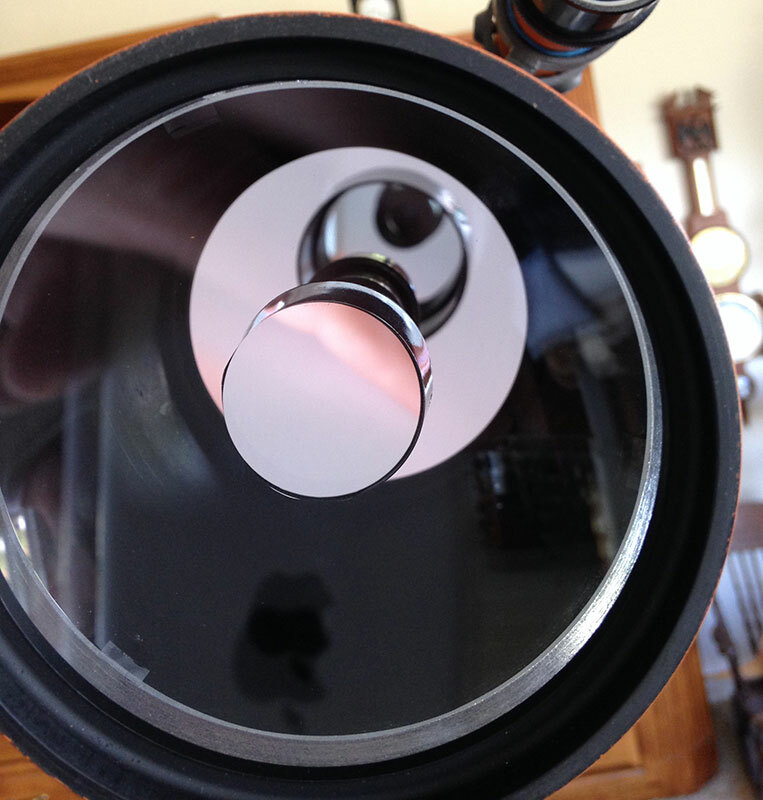 Celestron's website recommended Mobile One grease, so I tried that and it felt fantastic. Focusing felt much more positive with just a little more added resistance. I've since torn down all of my mounts that I had lubed with white lithium and replaced the grease with Mobile One and like it much better in those applications as well. Given the great results I've had with my little C90's, it makes me wonder why everyone doesn't own at least one. It seems as though they're always for sale for very little money on ebay. 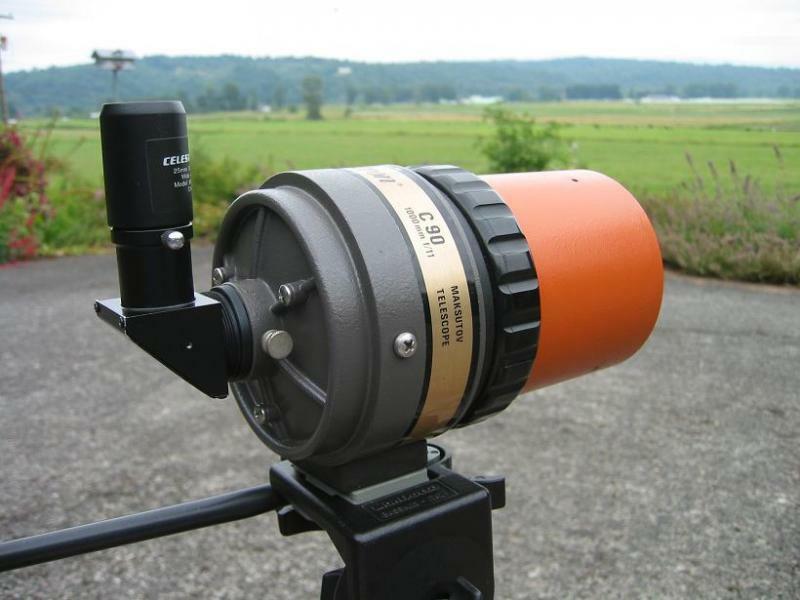 As was mentioned in previous posts, even if one is not totally blown away with their performance as an astronomical scope, they're sure to be very pleased with the results as a spotting scope. I really think you'd have to look long and hard to find a better spotting scope. The only thing I can think of as being completely awful about this scope are the worthless latches on the otherwise nice plastic carrying case. One of these days I'll replace them with something much more substantial. As for now, I always tie the case closed. Edited by kansas skies, 30 April 2016 - 04:14 PM. 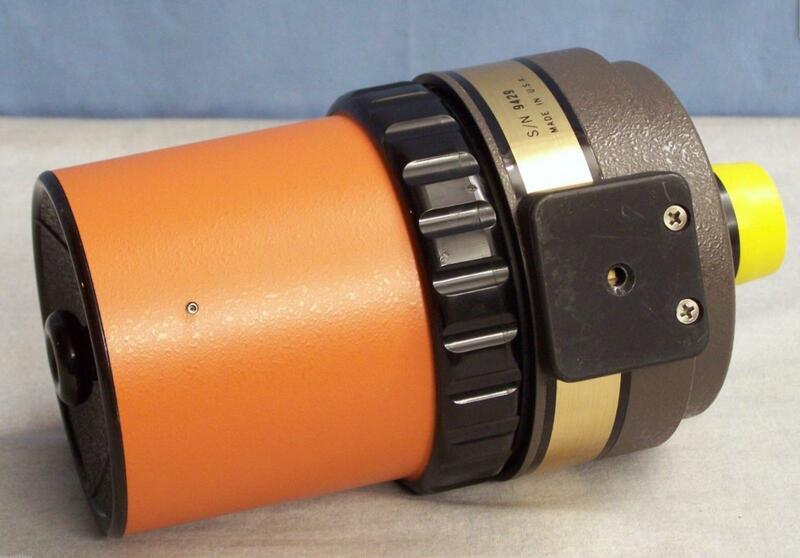 I have a very low serial number, orange telephoto lens version coming, so I am looking forward to putting it to the test. The thing looks mint! I like my little orange C5 so much, I couldn't resist. I have the perfect vintage tripod and panhead mount for it. Terra, do you have any info on the serial number of the orange tube C-90? Mine is 912082, which appears to be way high as far as S/N goes. Though it was made in the USA as well. Edited by terraclarke, 01 May 2016 - 09:14 AM. Here's a couple more. It is Minty! 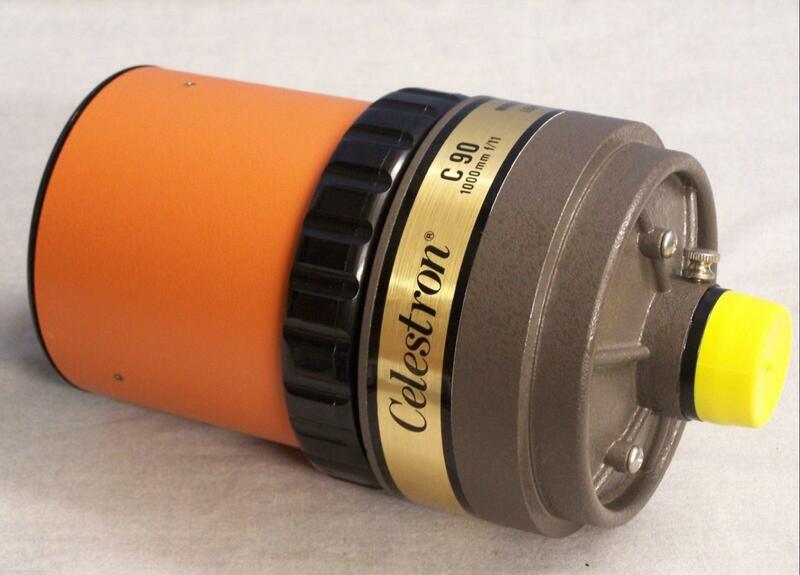 Here is mine, It is hard to think that Celestron sold over 912082 of oragne tube C90. Though I am not sure that the S/N is consecutive or randomly assigned number as years went by. Edited by schang, 01 May 2016 - 11:35 AM. I am a little curious about the accessory in the picture, however. It appears to be a T-Adapter, but from the length, it looks like the T-Adapter for the 500mm f/5.6 telephoto. The T-Adapter that came with mine is almost twice as long. Of course, the serial number on mine is in the 911k range, so the adapter might have changed through the years. Edited by schang, 02 May 2016 - 08:47 AM. I acquired an Orange C90 (SN 903492) just this past fall and in the last two weeks I was finally able to achieve first light with it. 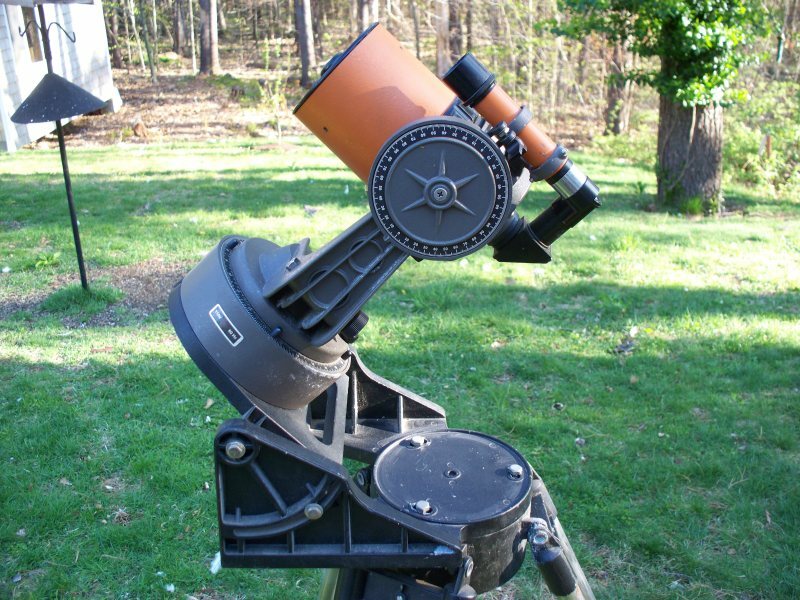 This is the complete C90 Astro setup with the original spring steel tripod, wedge and counterweights. 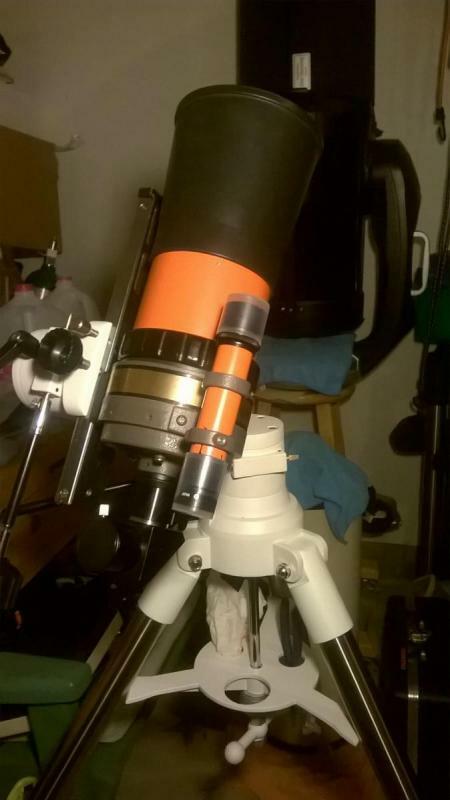 This one also came with a tele-extender; I just received a hybrid diagonal and intend to check it out with some 1.25" eyepieces, but in the mean time the 18mm Kellner has done the job. Views of the Moon and Jupiter were crisp and detailed and I was able to catch M42 before it set; a little dim (it is 90mm after all), but definitely a nice view nearly equal to what I was able to view with my ETX 90. A fun and easy scope to use, enjoy it! Edited by ETXer, 02 May 2016 - 09:17 PM. My wife picked this up for $60 at a consignment shop the other day, not really knowing what type of scope it was. 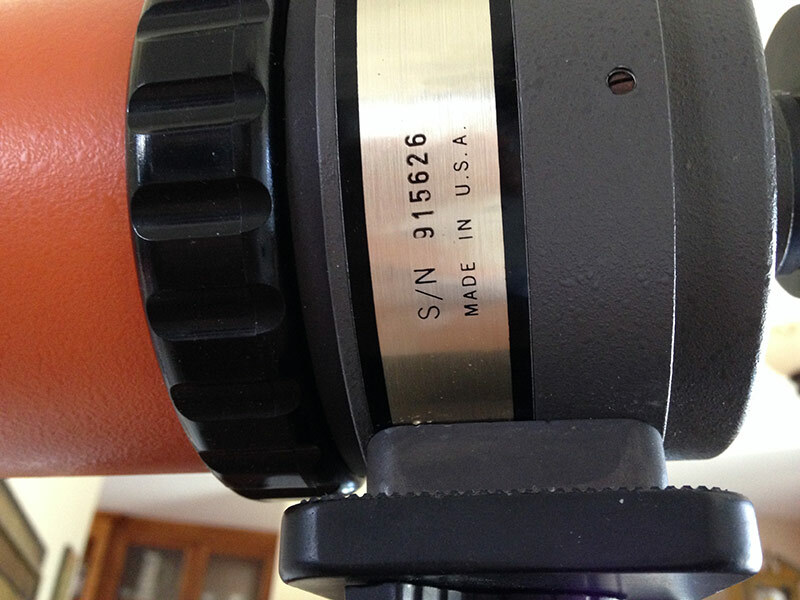 It says "MADE IN U.S.A.", but the serial number may be the highest in this thread: 915626. I wonder if it is one of the last original orange tubes made in the USA. It came with an upright prism, one 18 mm eyepiece (no diagonal), and a Celestron photographic tripod, so I suspect it had been used as a land spotting scope. The optics look pretty clean, but the exterior looks like it had been stored out for a long time (it did not come in a case, there is a little corrosion on the tripod, and it was all a bit dirty). I don't know about the collimation yet - I'm assuming it will be a little off. I like the idea of getting a 1.25" adapter for it. Did anyone figure out whether or not a Celestron 0.63X reducer will work with this scope? I wonder if it would make a decent wide field photographic scope? 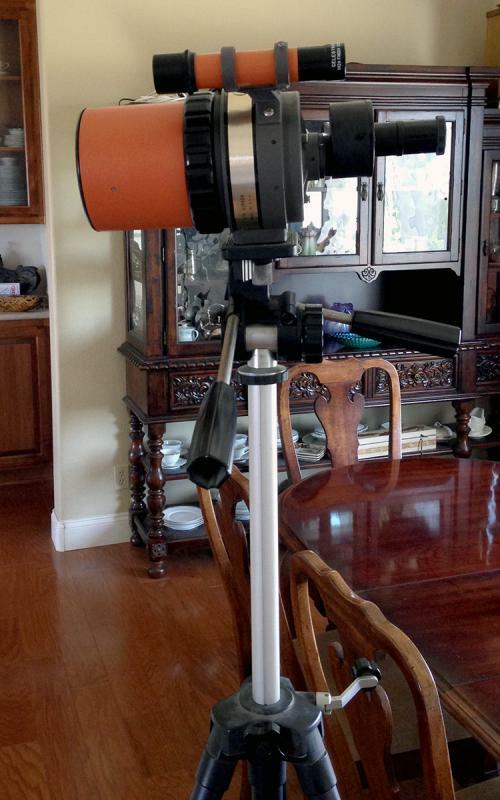 I like my little William Optics 81 mm refractor, but this scope might be fun to try out with a wide field view. I don't know how one would go about incorporating a focal reducer into the optical chain of a C90. However, I don't really think it would accomplish much - if anything, if it could be done. I would imagine that there is no more field available to be seen beyond that presented in the 30mm Kellner with which it was supplied. Still, what the C90 is good at is presenting one with some really nice views in a very small package. Basically, it's a long f/ratio Maksutov, and within those limitations, does a great job. Yours looks like a very nice example of this great little scope, and I think if you give it a chance, you might be very pleasantly surprised. I love to use mine with a hybrid prism star diagonal and my classic volcano top 1.25" eyepieces. The 40mm and 25mm Kellners do quite well for a 'wide field' view as does the 20mm Erfle; then the orthos to put things under closer scrutiny. About the highest I like to go with it as around 143X with the 7mm Meade research grade ortho. I worked on making dew-shield for mine today along with one for my C5. I rec'd my orange C90 yesterday from an eBay purchase. 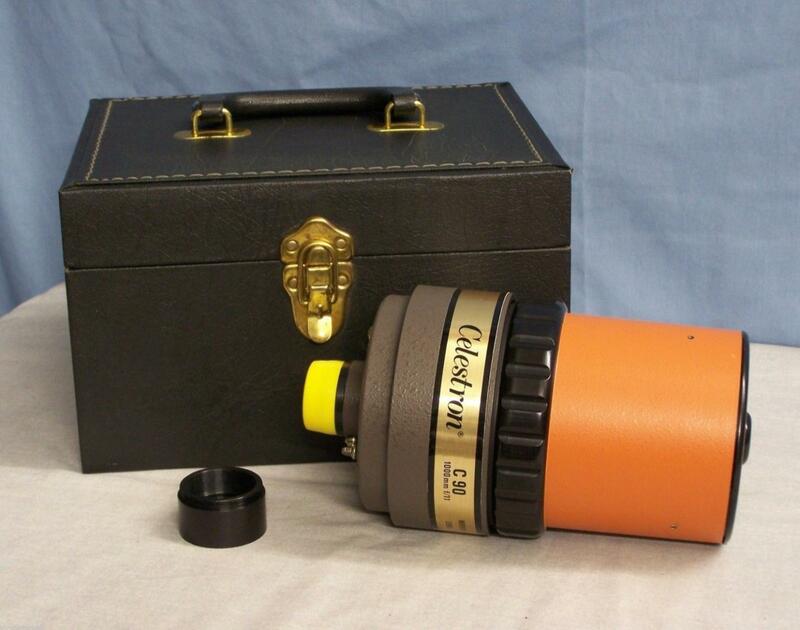 It was supplied only with a finder and an erecting prism accessory with a Celestron 30 mm Kellner in place. No case, nothing else, with this one. The s/n is also a high one! : 909542. Right now, puzzling over how to collimate it. Are the three Phillips head screws at the back of the primary cell just dust-stoppers? But, with a screw removed, I see no Allen setscrew, etc., inside the hole. I've been looking into how these would be collimated and it appears that they are assembled with the primary mirror fixed with an adhesive, so there's no easy way to collimate them. So, I suppose I'll just need to check mine when I can - I don't have any reason to believe it will be off, I just assumed that it would be because it's old and adjustable things generally shift a bit over time and with lots of moving around. I guess the key to keeping one of these collimated is probably careful handling (don't accidentally knock it against anything too sharply). I see. It looks then like it's not easily possible to collimate the C90. Well, I suppose that if one's luck is good, so is the collimation. On the other hand, maybe this is good training (practice... ) in "leaving well-enough alone". Not always easy to do... .
p.s. BTW, I think it was Spinoza who was the philosopher who liked to grind and polish lenses. But he also "liked to torture spiders", I recall (no, not telescope-secondary supports). Spinoza (Baruch aka Benedict) ground lenses because he knew how and needed the money to live, as far as I have read. Never heard of him torturing spiders, but I guess I wouldn't know. He had some real political enemies due to his views on orthodox religion, and there were some rumors made up about him to make him look like an evil monster (he was also excommunicated from the Jewish community). Torturing living creatures sounds a little contrary to his general personality, but again, I have no first-hand knowledge. No easy way to collimate I'm aware of. Have had half dozen of these and still have three I use regularly. Of all six, the perfect collimation point has been somewhere in the field - usually centered or slightly off center. Worst one was pulled to the right about half way but still very much in the field and certainly useable. Nice little scopes. Enjoy! This one from 1982 - collimation is dead center. I get an outstanding image out of it with binoviewers.